AMS is a browser-based software for ICBC Insurance Brokers, designed to grow with your business needs. AMS is easy to use and allows you to deal the day-to-day operation of your AutoPlan Agency. It provides the financial and marketing resources to grow your business as well as the security and inventory tracking needed to protect your business. AMS Home gives you an overview of how your office is doing. As a manager you can make sure the important tasks, such as batching & inventory control are being completed by your staff. See all branches at once in a multi-office environment. Need help? Get direct support right here. 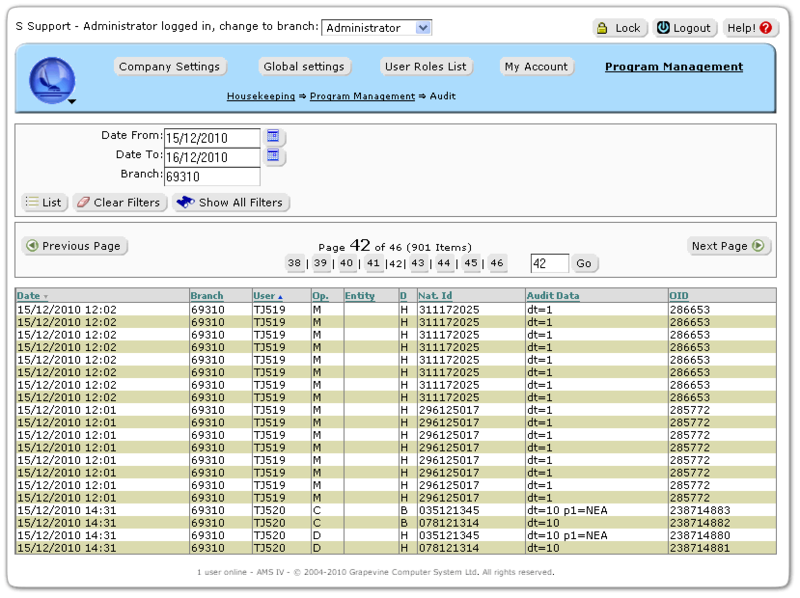 In a multi-office environment when signed on to AMS as an administrator, you can ensure all offices have their batches and inventory up to date by viewing the easy to read table on the home page. Log on and immediately be informed of your inventory shortages based on your own minimum quantity on hand definitions. 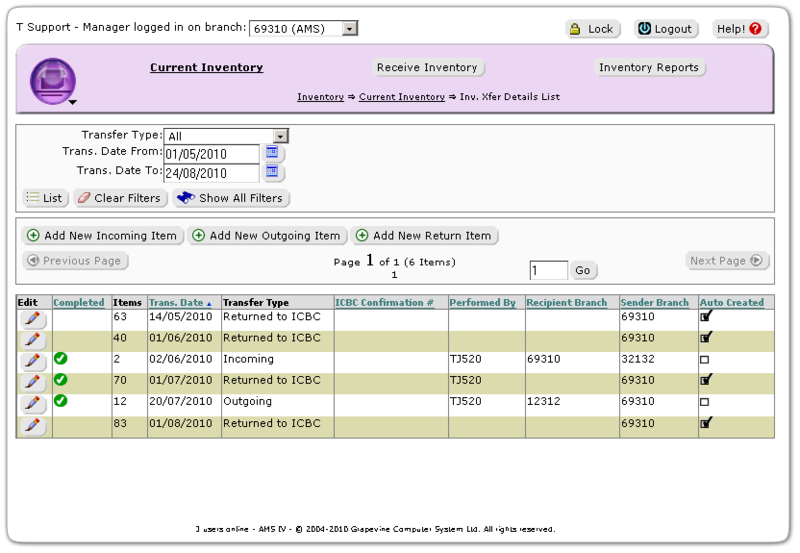 Also view and confirm ICBC return lists which are automatically generated at month end. Make sure you know where your inventory is at all times, with automated inventory control with real-time error checking. 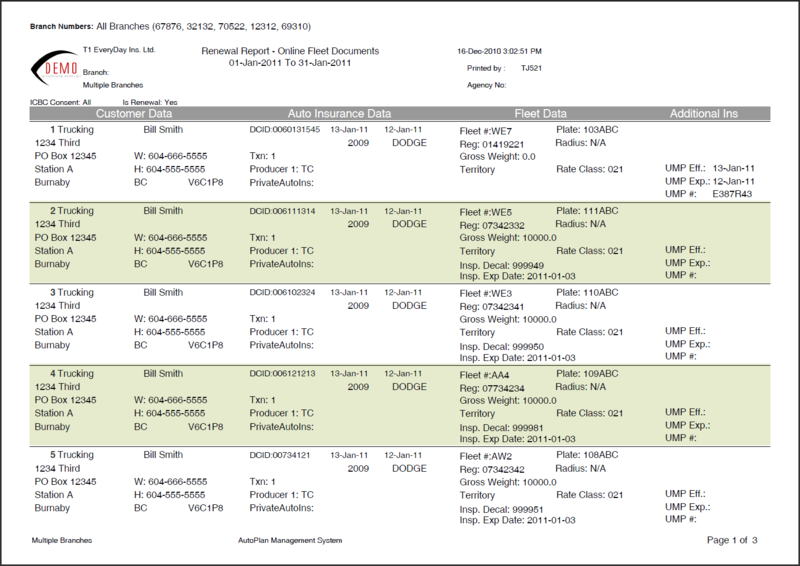 AMS automatically creates return lists, tracks quantities on hand and closes completed inventory. AMS inventory has an extensive checker to ensure your inventory is accurate. Keeps permanent records of all inventory, both open-and closed- view. All completed inventory is closed for archival review and auditing. Real-time inventory status on all inventory items, whether posted or pending. All decals, plates, permits & receipts are updated when the batch is posted. 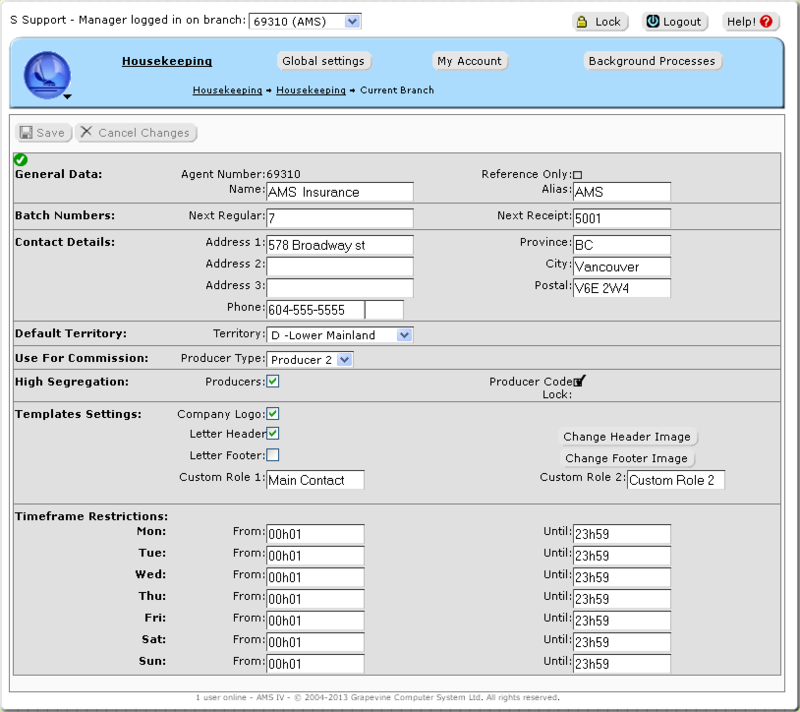 Control and assign inventory to road agents, specific agents or work desks. 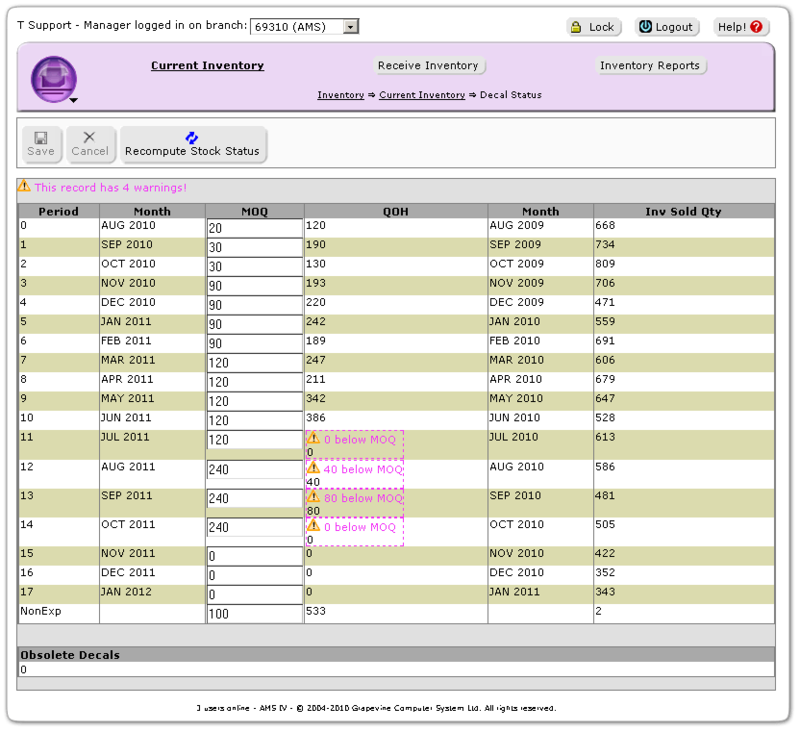 Road agent inventory is tracked through a road agent reporting system. 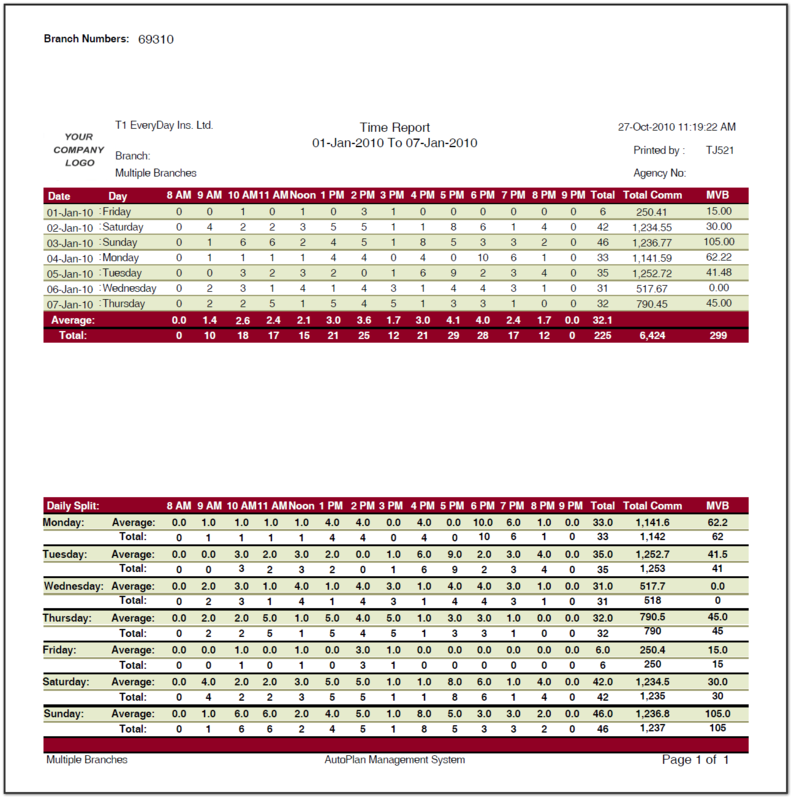 Full inventory status and reconciliation reporting, sold and unsold reports as well as customizable reports. Available in *.txt *.csv and *.pdf formats. Immediate error checking on Data Download Documents, new documents, and database history. Keeping inventory up-to-date and limiting human error. Set your own minimum quantity on hand definitions to have the program notify you of any shortages. Compare sales statistics from the same time period from the last year. Your obsolete return list is automatically created at month end, all you need to do is confirm the information and input the ICBC confirmation number for your records. Transfer any inventory between independent agencies and branches, including return of obsolete and defective decals to ICBC. Mark decals defective with one easy click, if you have the proper user rights. AMS can automatically download your ICBC data nightly making sure that your data is available to you first thing in the morning. It also extracts email and cell phone information for marketing purposes. Entering, Editing and Batching documents has never been easier. Automated nightly process, downloads your ICBC data, ensuring customer information is ready for batching first thing in the morning. 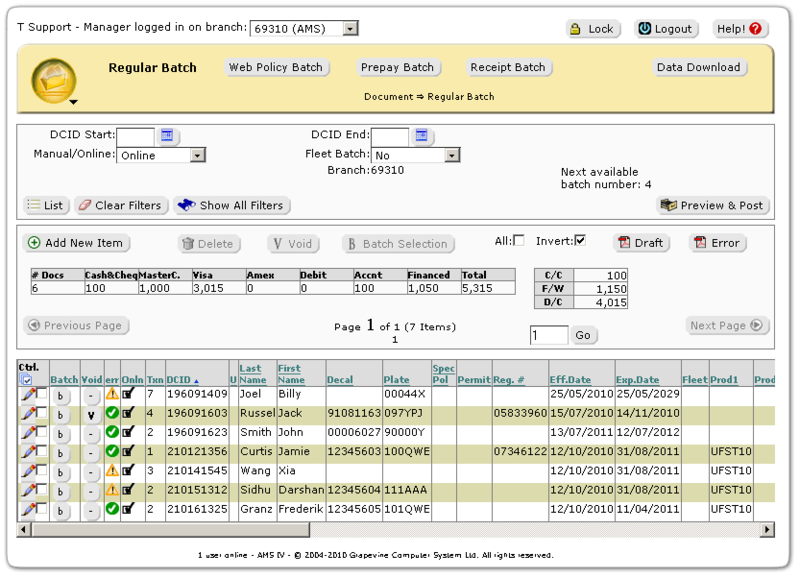 Full control batching system allows you to easily review the batch summary, roll back and re-post batches, add documents of the same type to previous batches, assign ICBC batch numbers to agent batches and reprint for previous batches. Edit documents before and after posting the batch, depending on user role. Batch and history information automatically synchronizes with inventory. Edit Information, control data processing ranges by DCID or date, users are able to batch online, special coverages, manual receipts, web policies, payment plans as well as online debt receipts. 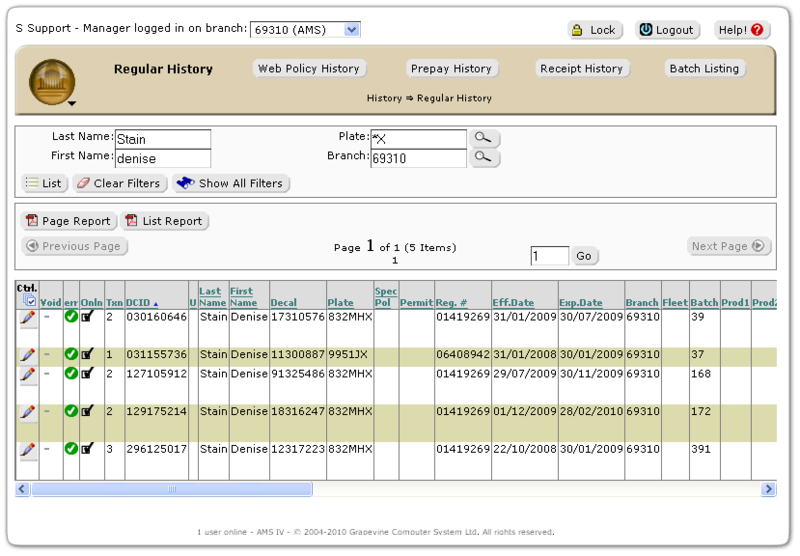 Online document processing screens have the identical layout to previous generations of AMS. If you mention your customer’s email and/or mobile phone number in the ICBC comments field in Policy Centre, it will be automatically be imported with the Data Download and saved to new email and phone fields in the documents. With AMS you have full customer information at your fingertips. Search an customers entire history with your organization using any of over 50 filters and wild cards including all branches. Fleet owners have special access to their own data, to help you provide superior customer service. Quickly find your customer’s history and policies with your organization, whether they have moved, changed vehicles or plates. Supply the best customer service by being able to quickly insure them at any branch. Search all policies by using any or all filters with more than 35 parameters. Use wild card searching methods to narrow down searches where limited information, allowing you to provide superior customer service. Search for customer information over multiple branches. Access to multi-branch data can be restricted by branch and/or by producer. Make changes to customer information, dependant on user role. When you market this customer, AMS will automatically only use the most current information. Edit Batch numbers, roll back batches, view batch reports, reprint batch reports, view batch error reports and return list reports. Managing your fleets has never been easier! This secure easy to set up feature gives your fleet clients individual access to their fleet information. The fleet user area allows your customer the ability to view the history of their account as well as review and export reports. AMS Fleet View helps you manage your accounts, your fleet customer interactions become fast and stress free, making it easier to retain your fleet customers. Marketing, Renewals and Retention are all here. AMS has smart renewal technology to automatically update to the most recent customer information. Comprehensive reports, available in multiple formats, renewal letters and labels created automatically via our built in template system. Marketing and Renewal information is automatically updated as part of the batch process. In a multi-office environment AMS uses exclusive technology to only display the latest policy renewal information no matter which branch an endorsement may have been posted. Save time by creating custom personalized reusable marketing and renewal letters, labels and postcards from within the program. Capitalizing on the efficiency of our mass marketing tool will allow you to provide superior customer service with a few clicks of a button. Let AMS create your renewal letters, postcards and labels automatically! 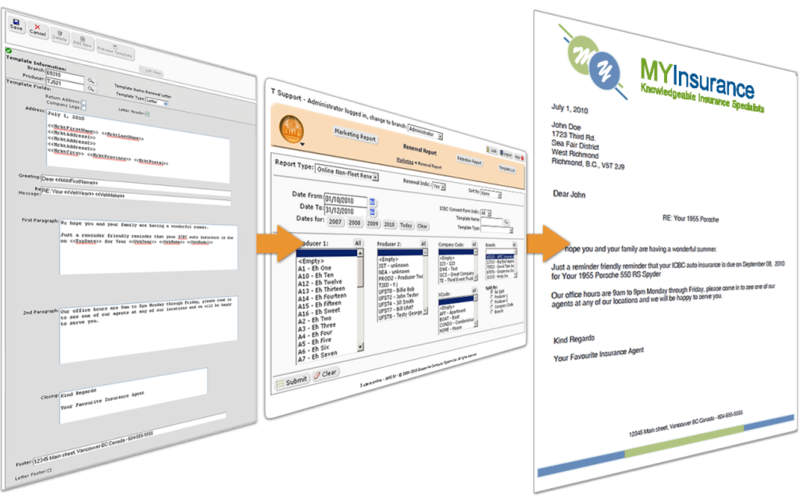 Using our unique internal template system not only can your create this marketing and renewal material without mail merging, but you can set it up on a schedule choose whether you’d like the reports on a weekly or monthly schedule and AMS will do the rest for you. AMS will email you an encrypted PDF, all you have to do is input your password and print it on your letterhead. A separate fleet renewal section allows you to track fleet policies. Detailed listings include unit number, plate and vehicle descriptions. List of all customers who have not renewed with your agency for follow-up and future marketing purposes. 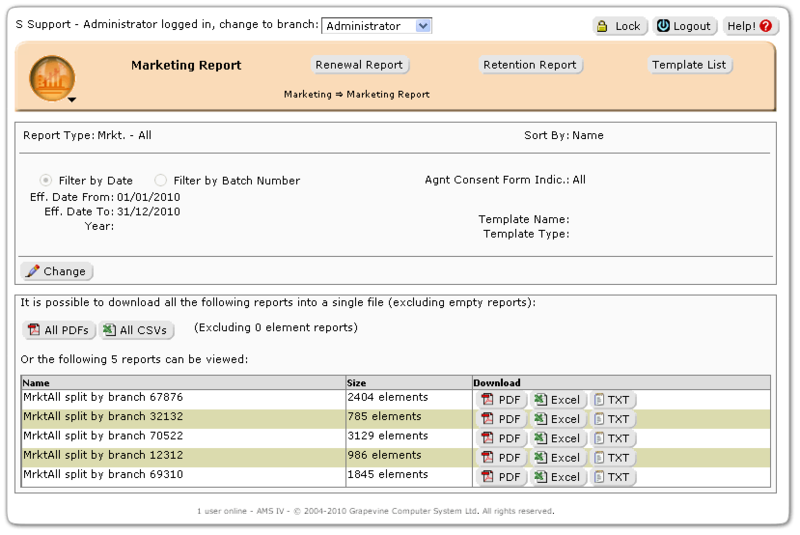 Create a multitude of different reports based on marketing and renewal criteria. Multiple reports can be created with different producer code combinations. 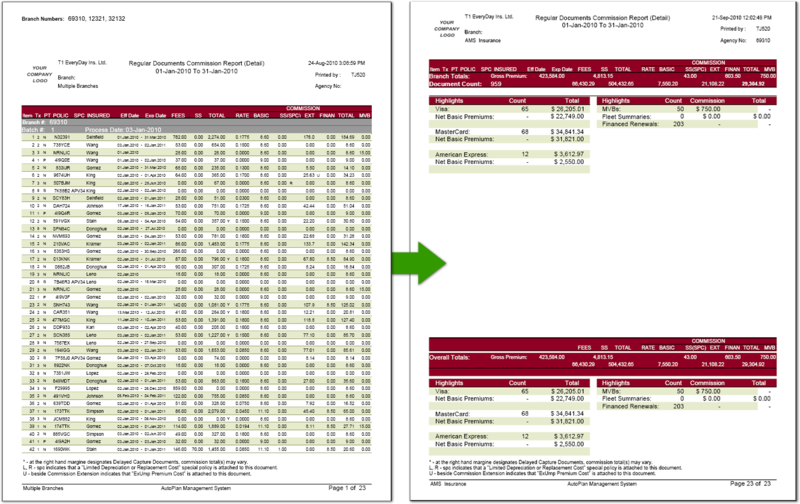 Available in text or graphic format for easy comparison of new customers, renewals, and changes over different time periods. Export reports to PDF, Excel and TXT formats, for printing and mail merging. Many reports are available, including production, time and void reporting to help you manage your staff as well as detailed sales, commission and invoicing to help you keep track of your money. 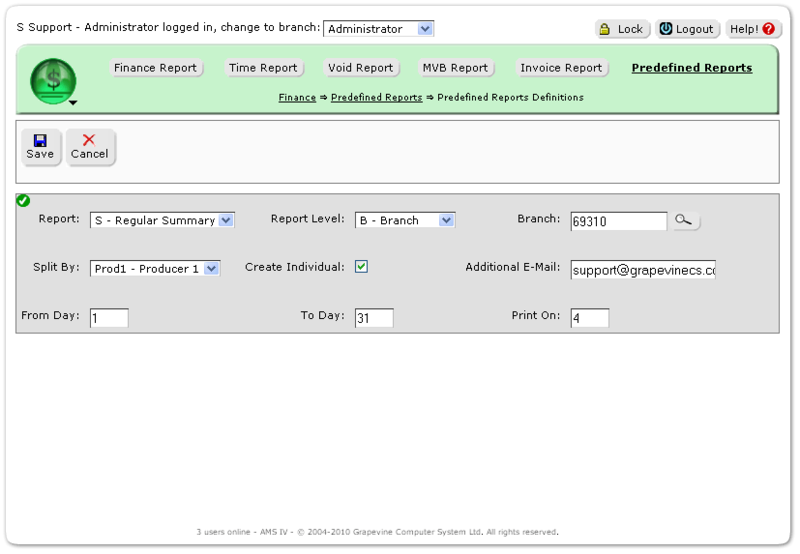 All reports can be automated so you can set it up once receive reports by email, automatically. Lists any day’s production regardless if these policies have been posted. This report is updated every time a data download is completed. Used to present statistical information of the number of documents processed during any given hour or day. This is vital for the office manager in setting staff schedules or quotas. 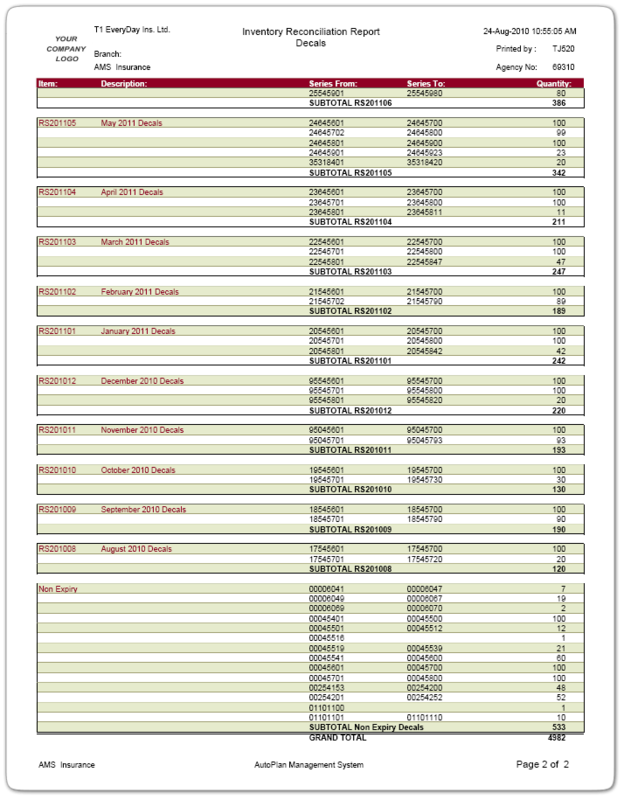 A variety of different commission reports can be created and sorted, by date or batch number. 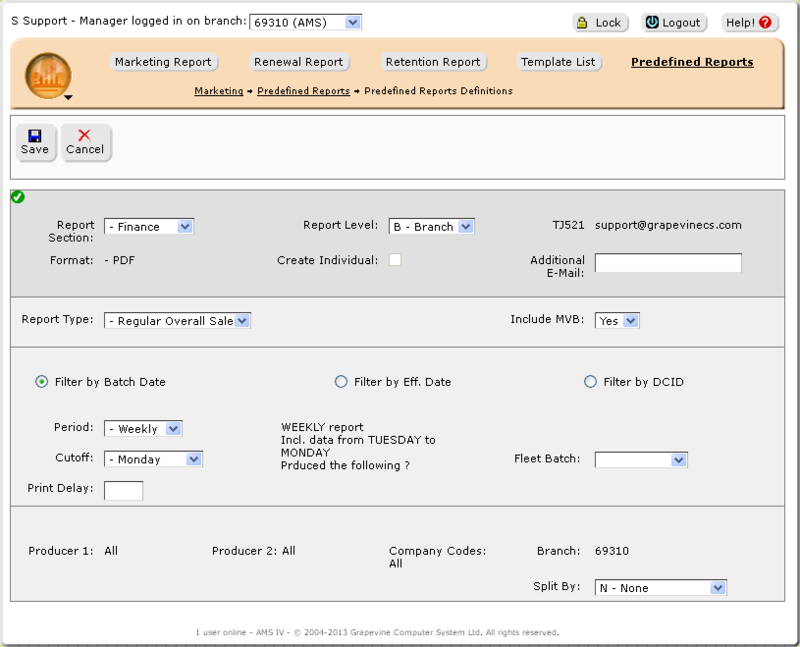 Reports can be further filtered by combinations of producer and company codes. All commission reports, void reports, MVB reports and invoice reports can be exported to Excel or text formats. Creates the commission reports you need automatically. Users can preset the date range, group, and type of report, providing an unlimited number of automated reports sent directly to your email in encrypted PDF format. These reports recur monthly and can be sent to more than one email. 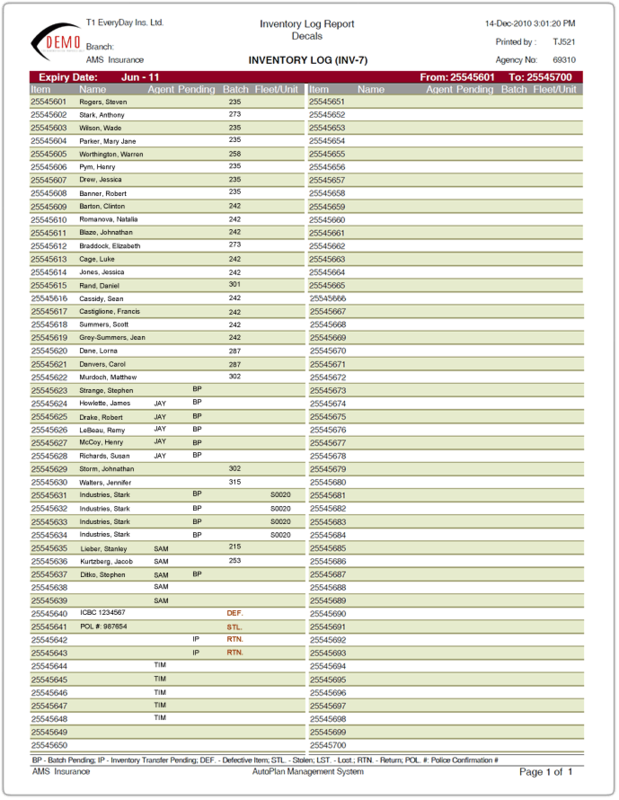 Commission reports can also be sorted by company name and fleet number for quick search of fleets. When you ‘print all’ in a split report, this feature excludes all reports with 0 records. AMS allows you to compare your company’s sales with the same period last week, last month or last year. This feature gives you a comprehensive picture of how your agency is performing. Also includes year to date comparisons. Manage travelling inventory by quickly assigning it to specific users or desks. Run individual reports and feel secure knowing where your inventory is at all times. Inventory is automatically synchronized as part of the batch process so you know what has been sold on the road. 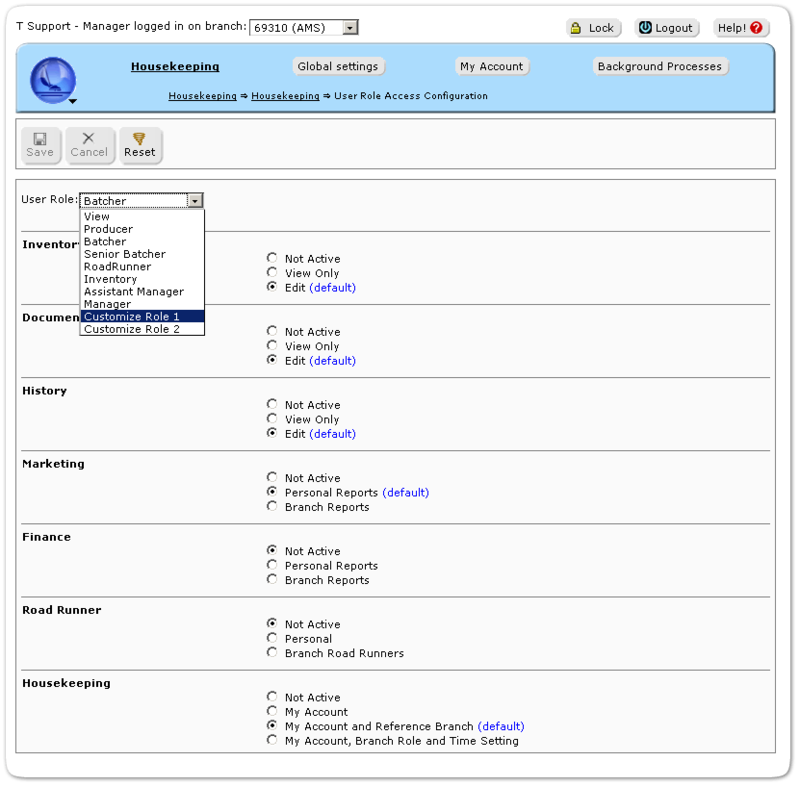 Manage all inventory assigned to an agent or defined stock briefcase. Transfer stock among Road Agents or back to the office. This feature can also be used for managers who service customers outside the office. All inventory assigned to a road agent is automatically synchronized with the inventory, after documents have been processed historical records still contain allocation information. 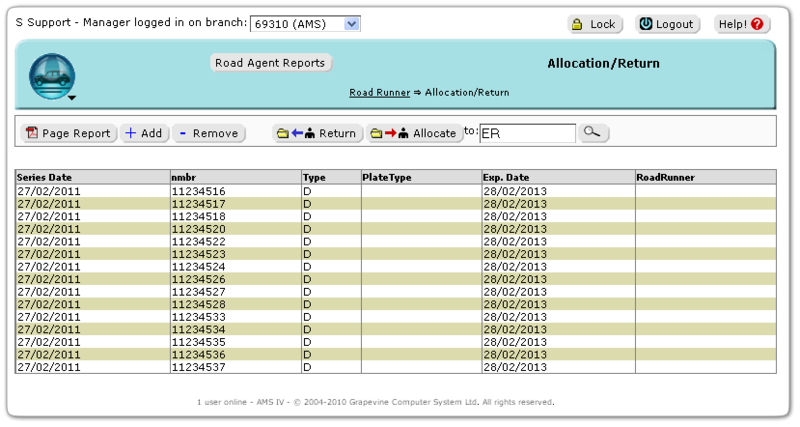 A time saving feature, allows Road Agent allocation of different inventory types and/or multiple series to be allocated centrally in one screen, with allocation report to include all current allocations. 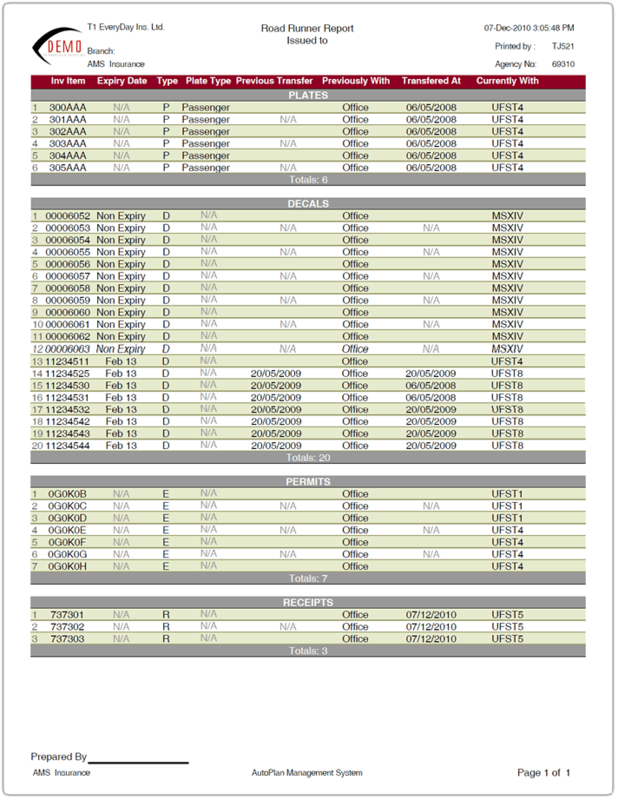 Create Road Runner Specific reports as well as transfer reports. 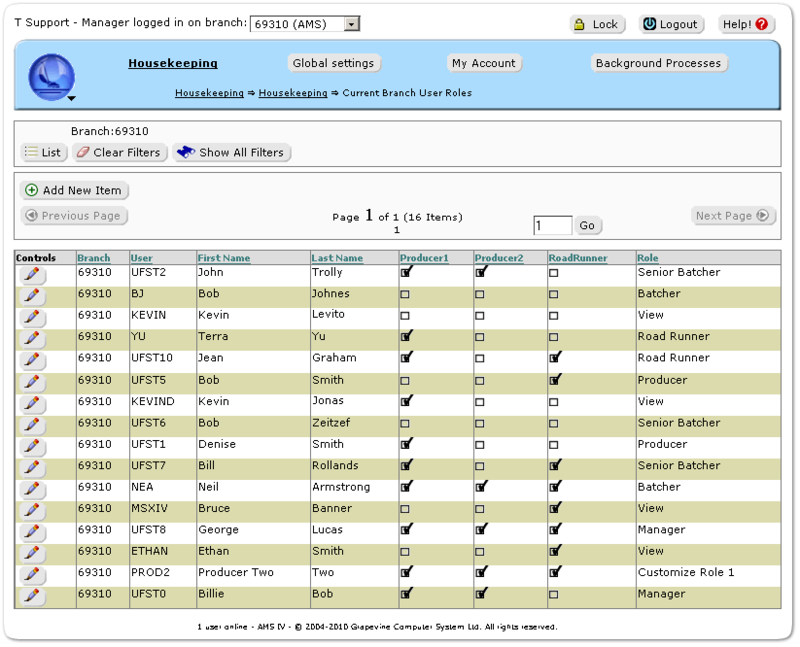 Customize your AMS in housekeeping, manage your branch as well as users. 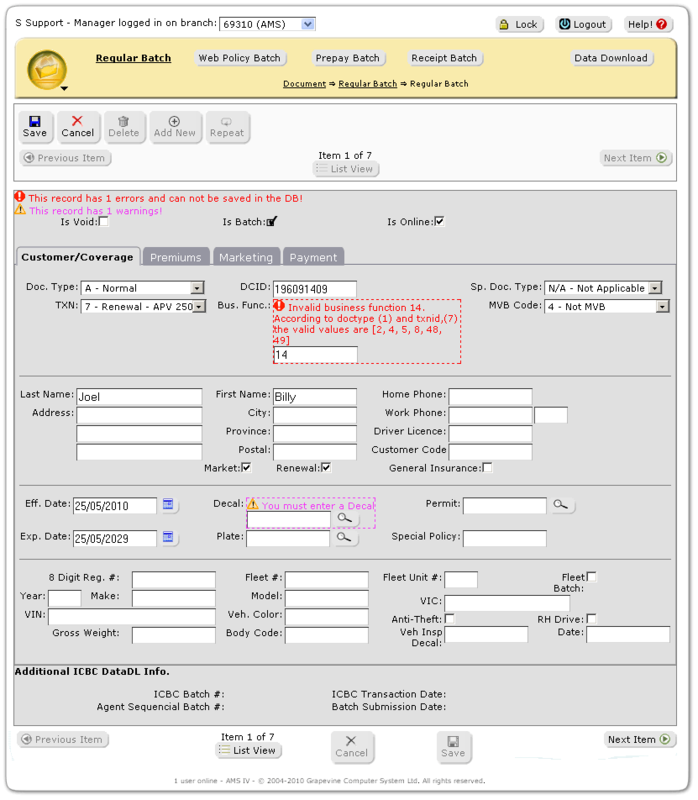 AMS has a secure user-role based system that you can customize to meet your branches needs. See what tasks are being performed in real-time and check the audit logs for all activities performed in AMS. Control Agency information (Name, address, telephone, hours of operation etc) on a branch-by-branch basis. Limits program access depending on assigned user roles. In a multi-office environment users may have different roles in each branch. Administrators can create custom user roles. Program access control is based on user roles, users can have different roles in each branch in a multi-office environment. 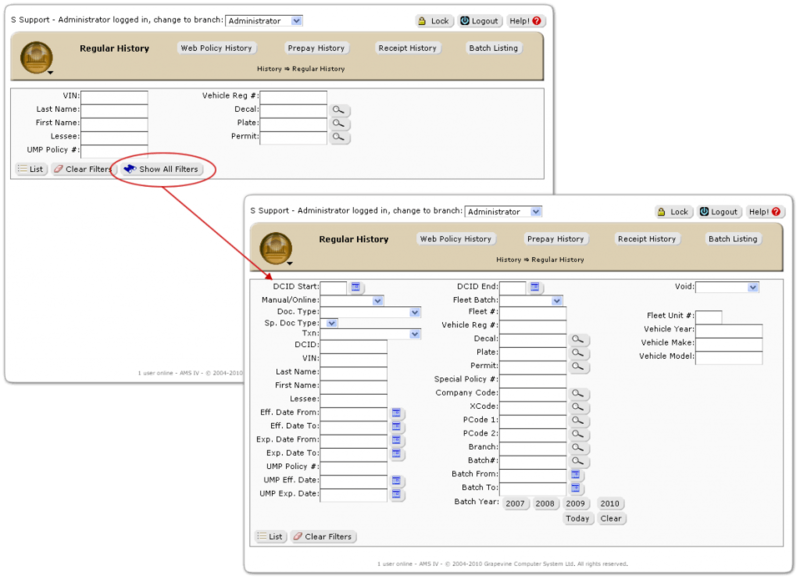 Lock user accounts, reset password and merge or change producer codes. A special access code can be created for clients to access their own fleet information. This will assist your agency in managing vehicle locations and uses. 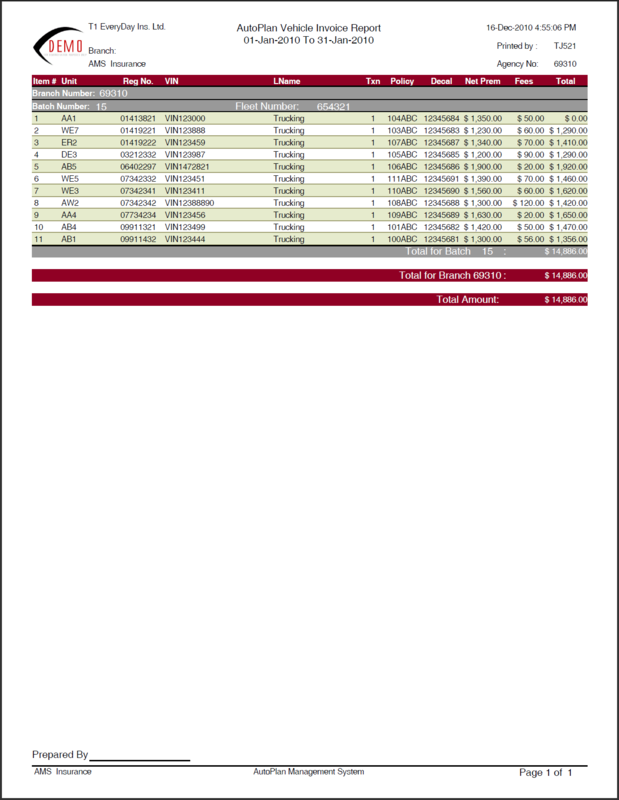 Administrators have the ability to view, but not edit, the program audit logs. The audit logs the who, what, where and when of transactions, as well as the user IP. Security is the top priority with AMS. The program has been OWASP tested and meets credit union and banking standards of security. AMS can only be accessed from within Canada, for added security. 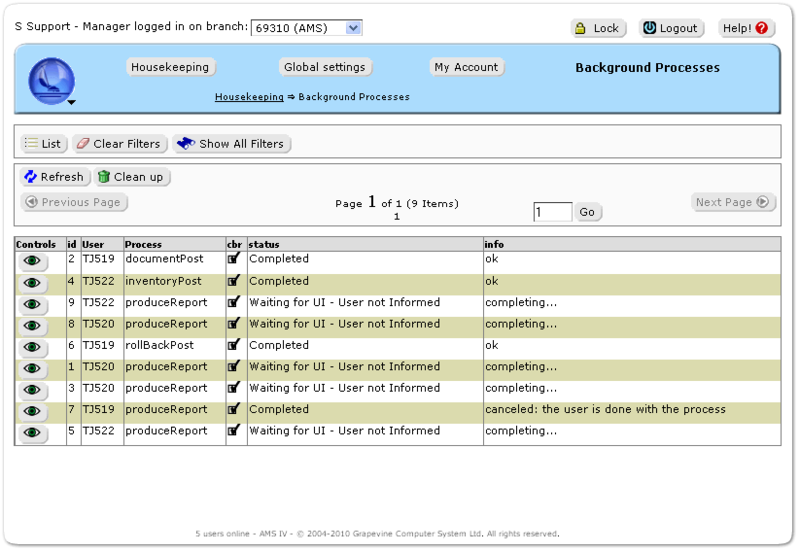 AMS audit logs track the who, what, where and when of transactions, as well as the user IP. 3rd party penetration tested, using the OWASP standard, which meets credit union and banking standards for application and site security. Our hosting facility has been inspected by ICBC. Company unique database is accessed from a 12 number uniquely randomized log on page with SSL encryption, user names and passwords are not auto completed. We do not save any ICBC user IDs or passwords, as per the ICBC Brokers Agreement. Program access passwords are one way encrypted. Track all inventory activities from date received from ICBC,whether it has been assigned to a producer or road agent, transferred to another office, available for sale, defective, or returned to ICBC. 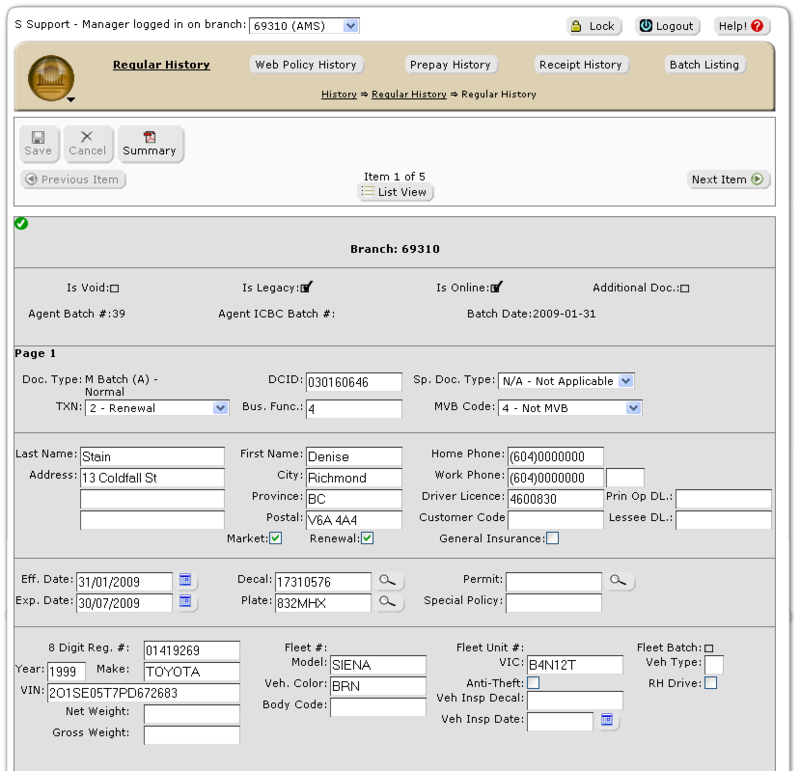 Assign police file numbers to stolen inventory for reference. The program can only be accessed from within Canada, in accordance with the Freedom of information and Protection of Privacy Act.